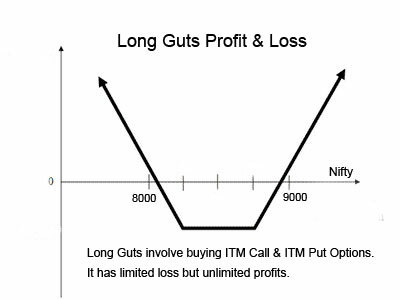 Long Guts is somewhat similar to Long Straddle, except here the traders buys 1 (or more lots) In The Money (ITM) Call options and same number of In The Money (ITM) Put options. Risk is Limited and Reward is unlimited. When to Trade Long Guts? When you anticipate a big movement in either direction – up or down on any stock or Nifty in the near future. The reason can be anything. A big news like budget, quarterly results of a stock, mergers, company buying another company, security threats, company going bankrupt etc. Whenever such a big news is coming, usually there is a lot of trading and the stock moves in either direction sharply. The trader profits if any of the option i.e. the Call or the Put exceeds the break even point of the trade. It is also important that Volatility also increases. Since both the options are very costly – Volatility has a major role to play in profit or losses in the Long Guts. Note: We will also see that Long Guts is cheaper than Long Straddle even though more money is required to trade this. Feb 02,2015: Nifty is closed at 8800. The Volatility is 20.41. 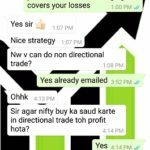 The trader decides to buy ITM 8600 CE @ 327 and ITM 9000 PE @ 240. Lets calculate this on one lot only as too much is at stake in this trade. Remember the trader buys In The Money options and they are very costly. This is a big problem with Long Guts. You may need a lot of money to trade this, but still its a better trade than the Long Straddle. Money at risk: (327+240) * 25 = Rs. 14,175 + Brokerage. Lets forget the brokerage for now. 9000 PE will also be 200. Total Loss: -127-40 = -167 * 25 = Rs. -4175.00. This is the max loss. If on the expiry day Nifty is at 8800 the trader will lose 100% of the money he used to trade this. However this is not the end of story. The trader now needs to calculate the break even points. So if on the expiry day Nifty is above 9167 or below 8433 – the trader makes a profit. Now lets calculate and see the breakeven for someone who traded the Long Straddle the same day. This was done on the 8800 strike. As you can see there is not much of a difference between the break even points of Long Straddle and Long Guts, but money at risk is less in Long Guts. 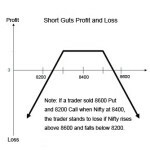 Therefore it makes sense to play Long Guts than the Long Straddle, if you have a Volatile view on Nifty. In a Long Guts it is very important to know the strike prices which you will buy. You have a problem here. If you go too deep – you will need to pay more. Agreed that max loss will decrease if you go deep into the money but the profit potential will decrease as well. Nifty will have to move significantly to profit. So the best strike prices are those that are slightly in the money. This means if Nifty is at 8500, you can buy 8400 CE and 8600 PE or 8300 CE and 8700 PE. Maintaining same distance from current spot will make it a neutral non-directional trade. If you are closer to the Call side then it will benefit more if the stock goes up, similarly closer to the Put means it will make money fast if the Stock falls. Ideally you should go same distance from the spot to select the strikes to keep it neutral. Going any further than 1 or 2% will almost certainly decrease your chances of making a profit and you may need too much capital to trade. You will feel uncomfortable. Volatility plays a major role in determining your profit or loss in Long Guts especially if you do not want to wait till expiry. Not waiting till expiry is almost always a good decision because you can always book profits whenever you are making 10 or more points which is 2% of the money blocked. Who knows on expiry day the long guts will lose its maximum. But if you are OK with the max loss, you can wait till expiry. In my view people waiting till expiry are gambling, not trading. They will make loads of money in 1 trade, and lose it all the very next. And then start from scratch. Long Guts will make money if there is a movement in one direction and/or Volatility increases. Therefore its very important that you have an idea of Volatility. Usually Volatility increases when there is a big news coming. You can trade the Long Guts a few days before the news is pending and booking your profits before the news is out. Because if the news is out, Volatility will decrease and both the Call and Put options will lose a lot of their premium. One example is General Budget. Right now VIX is increasing and I assume it will keep increasing till the Budget is out, end of Feb 2015. After that once the news is out, it will surely shrink. Another example is when a company is going to declare its quarterly results. You can get in 10-12 days before the results day and get out 1 day before the company announces its results. Note: Of course if you want to wait till expiry then Volatility is not important. On the expiry day options will have only the intrinsic values. Time and Volatility in the premium will be zero. One option will surely increase in value when the Stock moves. Supposing it went down. Now you may feel that people may start buying the stock and it may reverse. So the money you made in the Put option may go. In that case you can either sell the Put option you bought to book profits, or Sell another strike Put option that has increased in value. For example in our example Nifty was at 8800 when you bought the ITM 9000 PE @ 240 and now Nifty is at 8750, you can sell the 8600 PE at 82 and lock the profits. Now if Nifty reverses and starts to move up you will lose money from the PE buy, but make money from the PE sell (essentially locking the profits you made from the Put option), and the Call buy. Once you are making reasonable profits from all three trades you can exit. 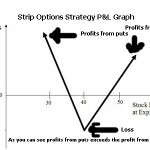 Therefore you should lock in the profits only when the options have crossed the Break Even points. Long Guts is a trade where the trader has a Volatile view on the stock. 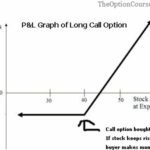 It is played by buying the In The Money Call and Put options. The trader benefits if there is movement in either direction up or down and Volatility also increases. Its better to take profits out before expiry because on expiry day the stock may reverse and finish exactly where it started and the trade may lose its maximum. Long Guts are better than the Long Straddle because the max loss is a lot less, however the profit potential is almost same. However this trade cannot be compounded as too much money is at risk. If you trade Long Straddle, after reading this article will you start trading the Long Guts? Please let me know in the comments. Wonderful article. I am realy learning a lot from these. And happy that it helped. Very very interesting article Sir. Keep writing. Nice to know that you have become a conservative trader. I have rarely seen aggressive option traders making lots of money, if they do – they are unable to keep it. 2nd or 3rd aggressive attempt eats their profits and some principal too. So just be conservative and hedge your positions properly. But for knowledge what is recommended time to play long guts in a series? At the beging on series? There is “no” recommended time to start playing Long Guts. Basically a trader plays long guts when he or she has a gut feeling that there is going to be a “huge” movement either side because of a news or some other factor. The only problem is they cannot predict direction so they try to “fire” both sides. This trade should be done for a few days only. You cannot set it and forget it thinking that you will be in profit one day or on the expiry day and you can exit. Time is against this trade. If no movement comes its better to take this off with a loss. If a movement does some, still the trader should book their profits and close. Staying more than 5 trading sessions in this trade is not recommended. If you stay for long say till expiry then one of the option may expire worthless and the other may not be able to recover the losses made on the other side. Very Interesting. Shall try it for sure in this ‘Result Season’. Let me check the useful dates. Liked the article on ‘Strap Strategy’ also. Educating myself with wise Lessons. I am very happy that you are educating yourself on options trading. Keep reading not just my site, but others as well and from any other source of good education on option strategies. You would come out a winner I guarantee. I have gone through many sites, but did not find them much interesting. Probably, it is the way you write and express yourself that the person reading the article feels a sort of bonding with you. Well, I like the way your articles are written with the flow of your inner self, which can be experienced by the reader. That conversational tone of writing is like Bonus along with the lines of wisdom spread in your notes. BTW, I ain’t easily convinced to praise some one just like that. I will be obliged if you could tell me a site or two to gain good knowledge on the subject. In this context, if you could teach me a strategy or two to earn profits from the options will satisfy me. For the time being, I am going through your lessons. The best way is to Google it. I do not know what you are looking for so best search – there is plenty of free stuff online. 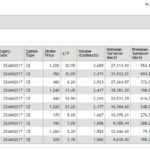 One simple thing that people don’t do it sell OTM options when you buy ATM options – that way even if you are wrong you will get back some money. Other strategies that are great are covered calls.